Jungle Masters, also known as “The Original Cave Tubers”, is located beside the most popular cave tubing site “Cave Branch Jaguar Paw”. They offer many jungle adventures such as: Mayan Ruins, Cave Tubing, Zip Lining, Waterfall Rappelling, The World Famous ATM Cave and many more Adventures in Belize. Tour with Jungle Masters and let them take care of the details. Whether you’re staying at a Resort, Hotel or arriving at the Belize City Cruise Port; Jungle Masters will arrange your adventures along with transportation at your request. This way you can tour Belize and enjoy an entire day of activities. We are Builders & Operators of Zip Line in Belize! (Association for Challenge Course Technology). adventure to see Gerson. You will not be disappointed. Thanks Emilio/Gerson! Hope to see you again! Experience Belize’s finest Zip Lines while “flying” over the jungle, followed by cave tubing down a blue refreshing river. You can also choose a more exhilarating activity and try Waterfall Rappelling. Even though these activities may be a bit challenging, Jungle Masters will guide you all the way and make it an unforgettable day. Escape into the Mayan Heart World and explore hidden tombs, ancient artifacts and some of the tallest structures in Belize. Learn about the Ancient Mayan Civilization and the famous hieroglyphs. 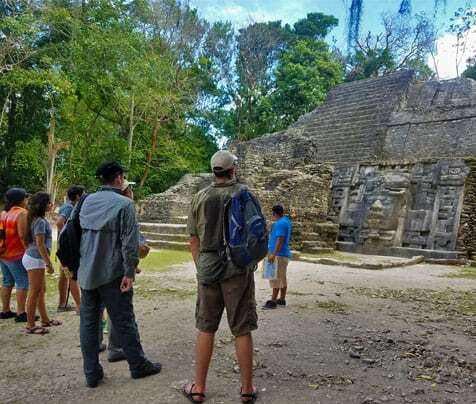 Explore a few out of the 900 Archaeological sites found in Belize. Choose a relaxing tour and visit The Crooked Tree Wildlife Sanctuary. This area is home to most of the 574 species of birds found in the country. Take and early morning or a late afternoon hike to visit these amazing tropical birds. Jungle Masters is owned by two brothers who grew up in Central Belize, and were among the first to ever tube down the river and into the caves. These men spent most of their child hood days in the jungle-hiking and exploring. Their knowledge of nature in the jungle makes them experts in touring and entertaining guests. Along with their training from the Belize Tourism Board, they are qualified to offer you an adventure of a lifetime! We cater for the solo traveler, couples, families or groups. Our shuttle transfer service can easily be arrange to take you anywhere in country: Placencia, Hopkins, International Airport (PGIA), Water Taxi for Ambergris Caye and Caye Caulker, San Ignacio or even to Orange Walk. Jungle Masters offers tours in all six districts. Combine and Book all tours for a wonderful, fun, relaxing and educational adventure in our country, your gateway to Central America and the Caribbean. Book Your Tours and Adventures with The Jungle Masters! Whether you're at a Resort, Hotels or Belize City Cruise Port; We will Pick you up! © 2014 - 2018 Belize Jungle Masters Site Map -::- Website By: Belize SEO Company.